Hey Coffeeholics! Proactiv has some awesome news for you! 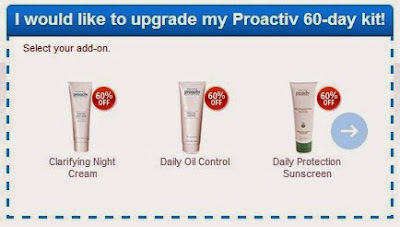 Their ongoing promotion of "Upgrade your ProActiv Kit and Get your Add-On at 50% - 60% Discount!" has been extended until December 31, 2013 under FDA Permit No. 1229 s 2013. Well, it's now rainy season here in the Philippines and with these erratic changes of weather, its so important to take care of our skin to keep it properly cleaned, hydrated, and protected to keep it smooth and clear. Investing on good skin care products is no laughing matter. That's why Proactiv is offering this awesome promo to help you level up from good skin to great skin through these various Add-Ons. These extension products from the Proactiv Solution range are available to further enhance your Proactiv experience by boosting your skincare regimen depending on your personalized needs. 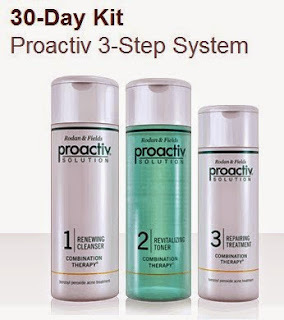 Try the Proactiv Solutions ADD-ON experience! All these Add-Ons have a discount depending on what kit you will buy. For a 30-day Proactiv Kit, you can get an additional Proactiv product at 50% discount while a 60-day Proactiv Kit gives you an additional Proactiv product at a 60% discount. Check out the amazing Add-Ons Proactiv Solution has prepared for you guys. Yes, Filipino weather can be pesky and if you are looking for an OIL FREE MOISTURIZER that offers protection from harmful UVA and UVB rays that age and damage skin, well then the Proactiv Solution Oil Free Moisture with SPF 15 is for you. 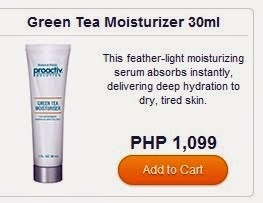 But if you have DRY ACNE-PRONE SKIN then try the Proactiv Solution Green Tea Moisturizer because it absorbs instantly, designed to deliver deep hydration to dry, tired skin. It’s formulated with concentrated botanical extracts and powerful antioxidants for a moisturizing experience that’s as healthy as it is refreshing. For those with acne prone skin, this Daily Protection plus Sunscreen is one of the Add-Ons you can include in your Proactiv Solutions order. This is a light, oil-free sunscreen has a patented micro sponge technology that helps absorb extra oil. Awesome right? 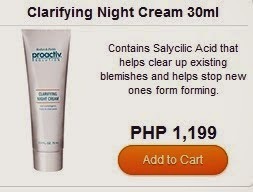 But if you really want to fight that acne, then you should definitely get the Proactiv Solution Clarifying Night Cream. It is a skin clarifying pore treatment combines acne-fighting salicylic acid with retinol for powerful anti aging benefits. What I like about this product is that it helps eliminate most acne blemishes and help prevent new break outs. Its the perfect night cream for acne-prone skin. For those with oily skin, well then maybe you should consider getting this Add-On instead - the Proactiv Solution Daily Oil Control. It's a dramatic breakthrough in skin care, this oil-free formula gently helps your skin balance its natural oil levels natural oil levels to help stop excess oil before it starts. So have you found the perfect Add-On for you? Then grab the chance now as you avail of this promo at the participating outlets. For those interested, this promo is only valid in Philippine Territory and at the following participating outlets: the Proactiv Online Shopping Cart and the Proactiv Door to Door Delivery Hotline. 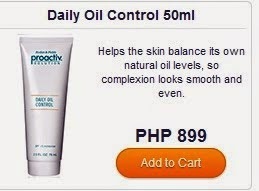 The Proactiv Online Shopping Cart can be accessed here at http://my.proactiv.com.ph so make sure you skip the www and just directly type the http://my.. part coz it sometimes doesn't work if you put a www when you type that on the browser. Oh and don't forget to choose the upgrade prior to completion of the online to avail of the promo! Their friendly Customer Service Representative will be glad to assist you in your queries and concerns! 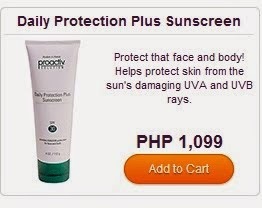 You may also contact them at this email customer@proactiv.com.ph. So what are you waiting for Coffeeholics? 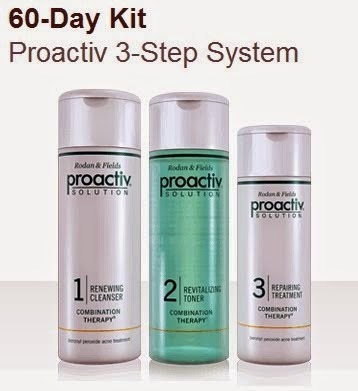 Take advantage of this Proactiv Solutions Add-On promo to further enhance your Proactiv experience and enhance your skin care regimen specifically for your personalized needs at a lower cost. Have a happy week! Proactiv users should really take advantage of this. I've heard this brand is really effective and I've been meaning to buy this for my sister but my budget is still lacking, hehe. Hopefully, I can save up before their promo ends.